The end of Dennard scaling and the looming Exascale challenges of efficiency, reliability, and scalability are driving a shift in programming methodologies away from conventional practices towards dynamic runtimes and asynchronous, data driven execution. Since Exascale machines are not yet available, however, experimental runtime systems and application co-design can expose application-specific overhead and scalability concerns at extreme scale, while also investigating the execution model defined by the runtime system itself. Such results may also contribute to the development of effective Exascale hardware. 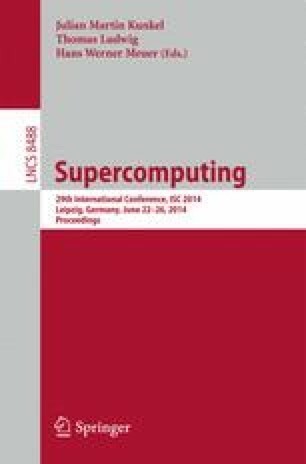 This work presents a case study evaluating a dynamic, Exascale-inspired execution model and its associated experimental runtime system consisting of lightweight concurrent threads with dynamic management in the context of a global address space examining the problem of mesh collision detection. This type of problem constitutes an essential component of many CAD systems and industrial crash applications. The core of the algorithm depends upon determining if two triangles intersect in three dimensions for large meshes. The resulting collision detection algorithm exploits distributed memory to enable extremely large mesh simulation and is shown to be scalable thereby lending support to the execution strategy.